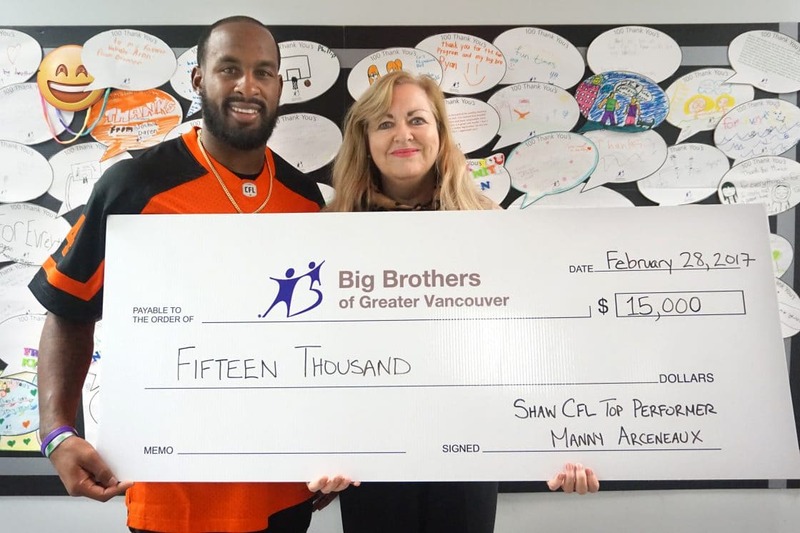 So says BC Lions football player Emmanuel (Manny) Arceneaux, who recently selected Big Brothers of Greater Vancouver as his charity of choice to receive a $15,000 donation from Shaw Communications. Including Manny, Shaw awarded three top CFL players with a combined total of $50,000 to donate to a cause that is meaningful to them. Manny was excited to discover a Big Brothers branch in Vancouver since he had a Big Brother mentor when he was growing up in Louisiana. “I was just a kid so I didn’t even realize that Big Brothers was an organization,” says Manny. His childhood football coaches played a big role in mentoring Manny and other kids in his neighbourhood. “We didn’t have a car back then so the coaches would pick us up to get us to practice. Growing up, they were more like coaches/uncles. It was Coach Franklin who got us involved with Big Brothers,” he explains. Manny moved to Vancouver in 2009 when he signed with the BC Lions, but he always makes time to see his family in Louisiana. “After a while though, I have to leave [Louisiana] because I can gain 15 pounds in a month from my mom’s cooking. Grits, eggs, bacon…everything in the South is fried,” he laughs. But anyone who has met Manny knows that the real Manny is exactly the kind of person who would attend a kid’s hockey game on a Saturday night just because he was asked. “One day I won’t be playing football. Somebody else will be wearing my [jersey] number, and people might not remember who I am [as an athlete] but that’s just life, you know. So I’m just trying to enjoy all of this while I can. It’s fun for me,” he says. With the generous support of Manny and Shaw Communications, more children in Greater Vancouver will now be able to spend face-to-face time with a positive role model.